A blessing of the Waikiki Beachcomber Hotel was performed Thursday by Kahuna Kakalaleo Kehau Kruse, left, and cultural adviser Kaipo Ho. 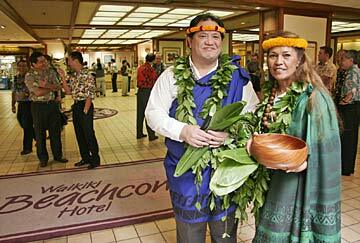 The role of the Hawaiian culture in the state's tourism industry continues to be a hot topic. There's a growing belief that a greater understanding of the Hawaiian culture is needed both on the part of the visitors who come to Hawaii and the people who work in the visitor industry if the state's dominant industry is to continue thriving. Visitor industry experts have said that Hawaii's host culture is what differentiates it from other sun-and-sand destinations and satisfies the increased demand by visitors for an authentic experience. Yet while there are plenty of native Hawaiians working in the visitor industry, the host community is noticeably absent when it comes to the management ranks -- making up a scant 10 percent or so of all decision makers, said Murray Towill, president of the Hawaii Hotel & Lodging Association. "Something that we would encourage and like to see happen would be having more Hawaii residents, especially native Hawaiians, get involved in the industry," Towill said. The state is working along with nonprofit, industry and educational partners to integrate and support Hawaiian culture in tourism through work force development programs that increase participation from kamaaina and native Hawaiians in the visitor industry, educational initiatives that introduce the concept of a career in tourism to secondary school students, and visitor events designed to perpetuate Hawaii's Polynesian heritage. "We're experiencing a cultural resurgence," said state tourism liaison Marsha Wienert. The days where plastic lei, metallic hula skirts and carved-up coconut bras were considered trendy or pono are long gone, Wienert said. "Our visitors are coming to Hawaii for an authentic experience and we need to give them one," she said. 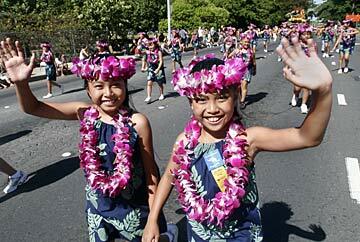 Among the native Hawaiian-based events that draws tourists and locals alike is the Aloha Festivals. During the 59th Investiture ceremony of the 2005 Aloha Festivals royal court in August, Moi Kane (King) Ambrose Napihaa, left, and Kamalii Kane (Prince) Cameron Kealii Bell give each other a ceremonial embrace. In right photo, Desiree Sousa, left, and Giselle Agsalud were among the participants at last month's Aloha Festivals Floral Parade. Gov. Linda Lingle's Economic Momentum Commission is considering several recommendations designed to shore up the relationship between Hawaii's visitor industry and the state's host community, said state economist Pearl Imada Iboshi, who sits on the commission. "Earlier on there was very little competition for Hawaii in terms of sand, sun and surf, but with increased competition from other destinations, visitors are becoming more sophisticated, and that has added to the demand for authenticity," Imada Iboshi said. The state's visitor industry is being encouraged to embrace the culture and heritage of the host community and has responded to the challenge by incorporating its traditions and ceremony into their corporate structure, Wienert said. There also is an effort to begin recruiting and training potential employees earlier, she said. In addition, the Hawaii Hotel & Lodging Association is working with the state Department of Education to develop curriculum and recruitment programs targeting adult learners as well as students in grades K-12, Towill said. The University of Hawaii School of Travel Industry Management and faculty at the Keaau Campus of Kamehameha Schools are developing a course designed to introduce juniors and seniors to tourism as a professional career. The program is one of several being taken to respond to a challenge from the Association of Hawaiian Civic Clubs to increase awareness of opportunities available to native Hawaiians at the TIM school and in the visitor industry, said Ramsay Taum, who serves as special assistant to the dean on Host Culture & Community Affairs at TIM School. "Native Hawaiians only make up about 6 percent of our enrollment," Taum said. Efforts at the TIM School to boost awareness of the host culture are vital to the success of the industry, said Jeremy Ke, a University of Hawaii senior enrolled in the school. "I'm part Hawaiian, but I was born and raised in another place," Ke said. "I moved here to have a career in the hospitality industry. Getting in touch with my Hawaiian heritage has helped improve my job performance as a tour guide for Hike Oahu. Now, I can actually give the visitors glimpses of what life was like in pre-contact Hawaii." Sharing the host culture with visitors is a natural extension of the concept of aloha, but until recently there has been a divide between the host community and the visitor industry, said Peter Apo, director of the Native Hawaiian Hospitality Association. "There's a wide spectrum of how Hawaiians view the industry -- some are against it while others have worked all their lives in the industry," he said. The tight labor market has made it difficult to attract strong kamaaina, especially native Hawaiian, candidates as well, said Judy Bishop, general manager of CTA Staffing. "It's a small community in the first place and there is full employment for those that want to be employed," Bishop said. "Out of the remaining people, how many go into management training programs?" Outrigger Hotels & Resorts, Hawaii's largest kamaaina hotel company, has learned that it pays to support Hawaiian values in the workplace, said Perry Sorenson, Outrigger's chief operating officer. "We strive to be a company that makes people proud to work here. If people aren't proud to tell their friends where they work, they won't do a good job for our customers," Sorenson said. Workplace satisfaction at Outrigger has resulted in a high percentage of kamaaina and native Hawaiian managers, he said. Almost 100 percent of the company's general managers in Waikiki are locally born as are the two vice presidents in charge of the company's Ohana and Outrigger division, Sorenson said. "We don't recruit outside of Hawaii unless there is a specific skill set that we can't find here," Sorenson said. Historically, many native Hawaiians have chosen not to consider tourism careers because they have had conflicted ideas about the relationship between their culture and the dominant visitor industry, said Antoinette Lee, president of the 2,400-plus-member Association of Hawaiian Civic Clubs. "It's always been stereotyped that local people working in the hotel industry would become housekeepers, front desk clerk, and gardeners but never be in the top jobs," Lee said. "Why is that? 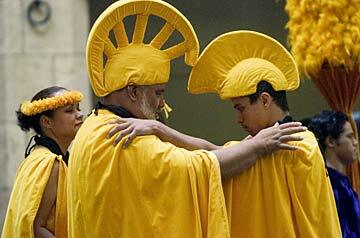 We know our culture best and we don't have to be taught aloha." Bringing more native Hawaiians into the industry will help make it one with the host culture and boost revenue at the same time, Lee said. "People come here to see us. We are the culture, yeah, we live it and breathe it," Lee said. "If they just wanted a beach, they could go to Florida."